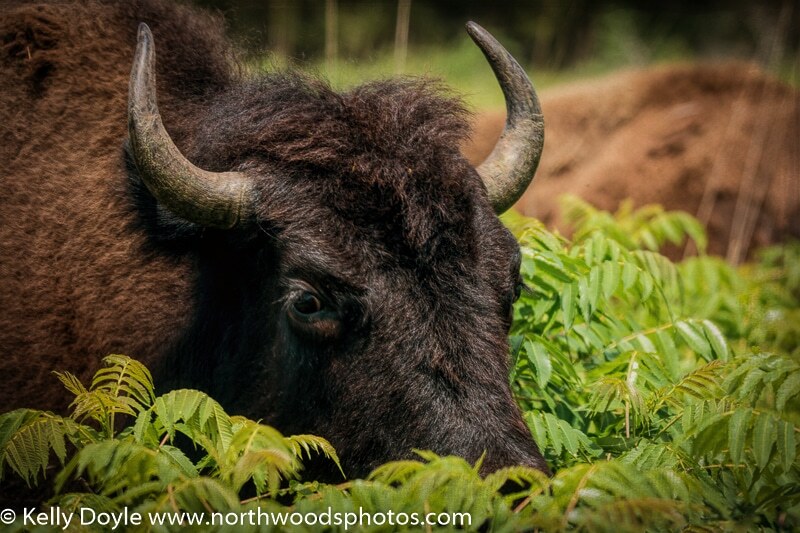 Did you know that as of September 2015, Minnesota has two herds of wild bison? At one time it is estimated that millions of bison roamed much of North America; from the forests of Alaska to the grasslands of Mexico, from the Great Basin in Nevada all the way to the eastern Appalachian Mountains. 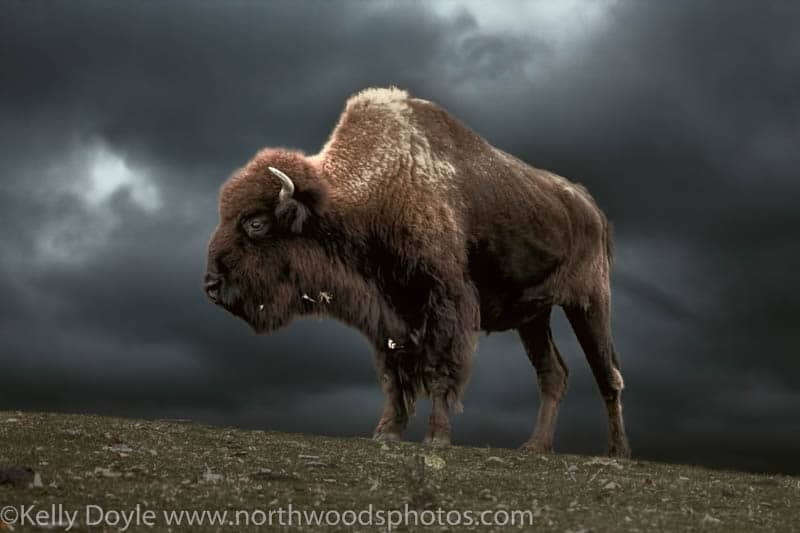 But by the late 1800s, there were only a few hundred bison left in the United States after European settlers pushed west, reducing the animal’s habitat and hunting the bison to near extinction. Had it not been for a few Native American tribes and intervention by the Dept. 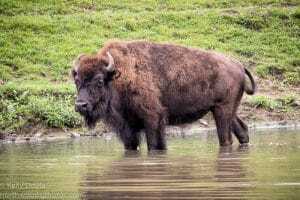 of the Interior, bison would be extinct today. Yellowstone National Park is the only area in the United States where bison have lived continuously since prehistoric times. These magnificent animals are the largest mammal in North America. Bulls can weigh up to 2000 lbs and stand 6 feet tall, while the cows are about 1200 lbs and reach a height of 5 feet. Calves (aka “Red Dogs” because newborns are orange-red in color) are born in the spring and weigh anywhere from 30-70 lbs at birth. 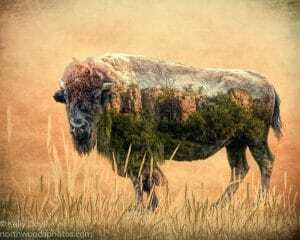 Bison once thrived on the tall grass prairies in western Minnesota, but have been completely eliminated from the wild. 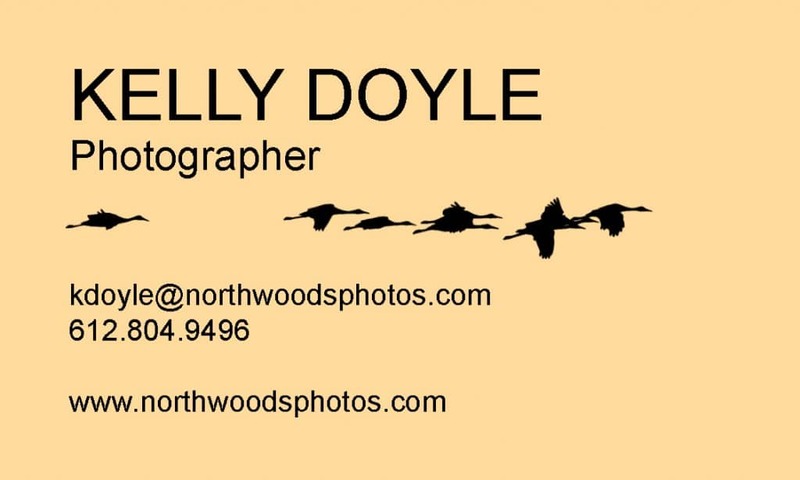 Our two “wild” herds at Blue Mounds State Park and now Minneopa State Park are contained within the confines of the park and are heavily managed. There is simply not enough grassland to support the herds, so their diet is supplemented during the winter months. They also receive vaccinations for pink eye during the fall round-up. Today, bison are found in small, fragmented populations and are unable to roam free across the nation due to human land-use. As a result, several small herds of genetically pure bison are managed as one large herd, so new genes can be added to populations every time bison are removed and added to the various herds during roundups. Approximately 95% of bison living today have beef DNA in their genes because of crossbreeding with cattle at some point in their lineage. The Minnesota DNR and Minnesota Zoo are working to preserve the pure bison species. 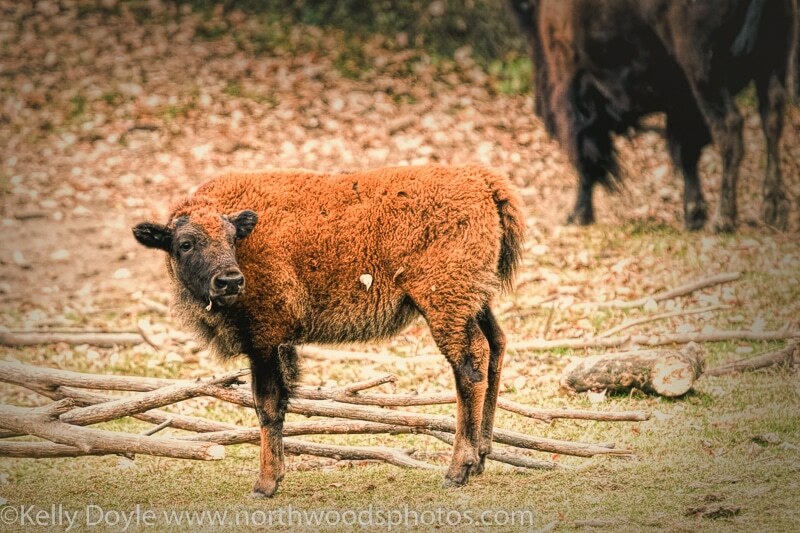 The wild bison herd at Blue Mounds State Park is one of the most genetically authentic herds left in the US! In September 2015, eight cows from Blue Mounds and three from the Minnesota Zoo were released at Minneopa State Park to create a new wild bison herd. Three calves were born there last summer and a new breeding bull from Teddy Roosevelt Nat’l Park will be introduced to that herd. Four cows at the Minnesota Zoo have also been impregnated with embryo transfers from Yellowstone bison to further expand the genetics, with hopes that one of those offspring (to be born this spring) is a male that will become a breeding bull here in Minnesota. Blue Mounds State Park in the southwest corner of the state near Luvurne. There is a bison ranch that sits adjacent to the park, so the animals you see off to your right when you enter the park are NOT the wild bison herd! Best opportunity to see the “real deal” is by hiking along the Western Loop Trail at the south end of the park. Minneopa State Park allows passenger vehicles to drive right through the enclosed bison range, but you are not allowed to get out of your car. I’ve had bison walk right next to my car when I’ve been there – close enough that you feel like you can reach out and touch them. (Don’t). There are also hiking trails all along the outside of the bison range, or you may be able to spot them from the Seppmann Mill overlook. Minnesota Zoo along the outdoor Northern Trail. You’ll also see Prairie Dogs and Pronghorn Antelope in the same general area.